Miller Digital Performance Black Welding Helmet 256159. 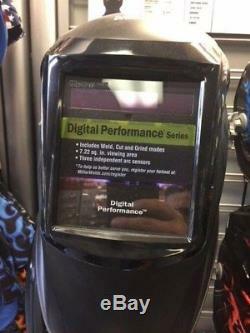 Digital Performance Series Welding Helmets. Our Mid-Range Welding Helmet for All Welding Applications. Digital Controls allow user to easily adjust mode and settings. Redesigned headgear features additional adjustability settings for better fit & comfort. Now with Grind AND Cut mode. Three Arc Sensors for superior lens response. Thee Operating Modes Weld, Cut and Grind. Auto-On/Off power control triggers lens at the strike of an arc. Quick Release Cover Lens allows for easy replacement of cover lenses. Viewing Area 7.22 sq in. 3.85 x 1.85 in (97 x 47 mm). Three Arc Sensors 1/ 20,000 sec. Three Operating Modes Sensitivity and Delay Control. Grind Mode Light State #3. Lithium batteries (2) with solar assist; up to 3,000 hours. Weight - 17 oz (482g). Meets ANSI Z87.2003 (High Impact) standard. All items come with our 30 day No Questions Asked Satisfaction Guarantee. Emails are answered daily M-F 7:30 a.
M - 5:00 p. M EST to ensure a quick answer to your questions. Hours of operations : M-F 7:30 a. The item "Miller Digital Performance Auto-Darkening Black Welding Helmet 256159" is in sale since Wednesday, October 3, 2018. This item is in the category "Business & Industrial\CNC, Metalworking & Manufacturing\Welding & Soldering Equipment\Welding\Welding Protective Gear\Welding Helmets". The seller is "robertsoxygencompany" and is located in Raleigh, North Carolina. This item can be shipped to United States.